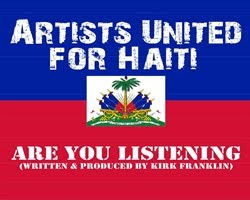 Discussions Magazine Music Blog: KIRK FRANKLIN's Artists United For Haiti/"Are You Listening?" KIRK FRANKLIN's Artists United For Haiti/"Are You Listening?" (New York, New York – January 21, 2009) As gospel music artists gathered in Nashville, Tennessee to celebrate the biggest and brightest at the 25th Stellar Awards this past weekend, they also came together for a higher purpose. With the recent tragic earthquake in Port-au-Prince, Haiti, Kirk Franklin assembled numerous award-winning gospel music artists in Nashville’s Quad Studios to lend their voices to “Are You Listening,” a song they all hope will inspire those devastated as well as raise much needed funds for Haiti. All proceeds from the record will be donated to charities involved in relief efforts. Artists United for Haiti includes (listed in alphabetical order) Yolanda Adams; Jeremy Camp; Shirley Caesar; Dorinda Clark-Cole; Natalie Grant; Fred Hammond; Tamela & David Mann; Mary Mary; Donnie McClurkin; Bishop Paul S. Morton; J. Moss; Smokie Norful; Marvin Sapp; Karen Clark-Sheard; Kiera "KiKi" Sheard; BeBe Winans; CeCe Winans and Marvin Winans along with other gospel artists featured in choir including Shari Addison; Kathy Taylor Brown; John Gray; Bishop Darryl Hines; Stephen Hurd; Karima Kibble; Judith McAllister; Nicole C. Mullen; Jessica Reedy; The Neville Sisters; Troy Sneed; Micah Stampley; Melinda Watts and Brian Courtney Wilson. The Gospel Music Channel (http://www.gospelmusicchannel.com/) television network had exclusive access to the historic gathering and recording session. GMC is producing the official music video for “Are You Listening: A Love Song for Haiti” which will world premiere in a one hour special presentation on GMC Friday, Jan. 22 at 7:00 p.m. (ET), immediately before GMC’s airing of the global “Hope for Haiti Now” telethon (8:00 p.m.). The special will be hosted by Lisa Kimmey-Winans and will feature exclusive interview footage with Kirk Franklin from the recording session interspersed throughout multiple runs of the music video. GMC will encore the special on Saturday, Jan. 23 at 6:00 p.m. (ET). The music video will then go into heavy rotation in all GMC music video blocks. GMC will also produce and premiere an exclusive “A Love Song for Haiti: The Making of ‘Are You Listening’” behind-the-scenes special in February. “Are You Listening” will be available for purchase at http://www.verityrecords.com/ starting at 5 p.m. Friday, January 22.